This course addresses the design requirements for gas, oil, coal, and waste fuel fired steam generating, water-tube boilers and components with steam capacities between 20,000 and 250,000 pph and maximum pressures of 450 pounds per inch gauge (psig)/saturated and 400 psig/700 degrees F superheated. Topics discussed include fuels, coal ash, burners, primary air, stokers, overfire air and boiler stacks. Learn about the benefits of adjustable speed motor applications. This course is intended for mechanical engineers and other design and construction professionals wanting an introduction to steam generators for a central steam boiler plants. This course will give mechanical engineers and others information about the selection, specification, installation and operation of steam generators. 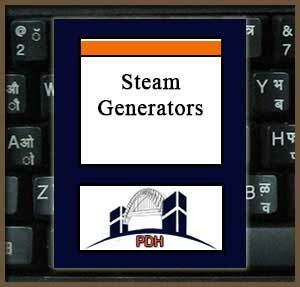 This course provides introductory information about steam generators and associated equipment and systems. This course will give you professional tools that will help you to understand the technical and design considerations to use in design of steam boiler installations such as central steam boiler plants.